For many teachers, making the change to PYP can be overwhelming, not only with all the jargon, but the complete shift in thinking. It’s not that the concepts are strange—it’s not even that we weren’t already doing these things. The change is in the focus, and one of the big focus points is in developing critical thinking. Critical thinking isn’t just for PYP teachers, of course. It is one of the most important skills we need to develop in our students (and one of the ubiquitous 21st century skills that have come to the forefront of educational discussion). And it isn’t limited to a set of subjects; we can and should apply it to everything we do. 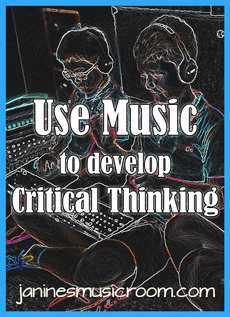 So today I’m writing about some ways to develop critical thinking in your music class OR some ways to incorporate music into your classroom. You can make some great connections to literacy learning, using lyrics—or even music without words—in the context of making text-to-self / text-to-text / text-to-world connections. Music is wonderful fodder for critical thinking because it speaks to us in ways that we can’t always explain or even understand. Instrumental music requires some level of critical thinking simply to translate it into words! Even the youngest students can do this successfully. Any kind of music can be a starting point for thoughtful discussion: any genre, any language, any culture, solo or ensemble… You might choose music that speaks to you as the teacher. You might let students offer suggestions. Choose something familiar or unfamiliar, tonal or atonal, composed or improvised, recorded or live. Use some of the questions below (or see this post for more) to start your discussion, and off you go! Once students have shared their initial thoughts, follow up with questions that encourage them to support their ideas (“What makes you say that?”) or think from different perspectives (“Why might ___ think differently?”). Older students might discuss in groups first, then share their already-developed thoughts with the class. You can take these discussions as far and as deep as you wish. No matter how far you go, simply modelling this kind of questioning and encouraging new ways of thinking will help your students to become better thinkers and learners.